This sample is just a brief offering to give you a general idea of what your chakra reading will look like. After the inital chakra reading is completed, several emails are exchanged in order for a person to fully comprehend the deeper meanings behind these portraits. Many questions are asked and answered between you and your reader. Following the reading, your reader will do a very powerful remote healing session to balance the chakra system. As I first look at your overall chakra readings, I would say that you have been doing some conscious work to balance your chakras, but much more work needs to be done to attain some balance here. The area that is going to require the most attention at first is going to be the 5th chakra. It feels like you have been doing some preliminary work to raise your vibrational level and to bring in more Light. This is good and whatever you are doing, you should continue to do this. In addition, you could add a little more grounding earth energy to start to anchor some of the information you are receiving. You might find yourself very drawn to the higher energy and perhaps prefer not to deal with some of the issues head on that might be facing you. This is OK for a period of time while you are building your Light Quotient, but eventually you will have to confront these issues. As you are doing this work, you are working towards building up your self esteem to validate the truths that you are coming to know. This just takes time and will happen in divine order. Starting with the root chakra (E1) with an elliptical reading here, it is indicating some ambivalence in grounding this energy and the fuller understanding of it. When you do ground it back down, what happens is you have to deal with it in 3D, not always as joyful as when you process it in the higher realms. The ambivalence is in being here or there. But nevertheless, it is what you will be called upon to do. If you place some additional emphasis on sending your root chakra down into the earth energy and exchanging this energy flow back and forth, you will feel much stronger and your inner personal power will start to increase. This will help 3F (H4) as well, particularly if you bring it to that chakra and fill it up, clear it out. When these two charkas balance out more, you will feel more powerful, but with less need to be overly aggressive, pushy or disgruntled about things – more like peaceful power. Moving up to the second chakras, there is a strong indication that you are very open and receptive to sharing yourself with a mate (2F – V3), but you may have difficulty in keeping the energy consistent. You might prefer to connect more spiritually or to your creative self instead. This may cause some ups and downs in a relationship if you have one. With the H3 reading in 4B there also is some indication that you may not always get back what you give out and at times may feel that the love and caring is not being returned. This reflects self confidence and allowing yourself to receive. You may consider yourself to be a very giving person and who finds joy in that process, but it is also possible that at times you don’t feel it is returned. Part of this relates to a lowered self esteem issue that you will need to work through. Giving and receiving needs to be experienced in a balanced way, otherwise eventually a person erupts with feelings of being overwhelmed and under appreciated. This reaction can be seen in the R4 reading at 5F – holding back thoughts and feelings and then finally blurting them out in an unfocused, unbalanced way. Not having a clear direction of thoughts, words and feelings from your deeper self. The 3F chakra indicate that you are truly holding back on your personal power at this time, perhaps with the H3 reading in 4B, you are not confident that you can do this and so you hold back. You may make up for this inner feeling by doing much for others and giving of yourself, somewhat selflessly, but again, eventually this will come out as not feeling fair. Remember when it does, that you are the one who sets the stage by creating your boundaries with others. They will take as long as you give, so just learn to keep the cycle of giving and receiving in balance. The 3B reading of C3 indicates that you do take good care of yourself (exercise/diet), your physical body which is good. Now you need to nurture the emotional body a little more and listen to what it is saying to you more often. Learning how to act on these feelings without seeming off balance will be your goal. The 4F chakra in a V2 shows that perhaps you have recently begin opening up your heart center to feeling more love towards those around you and perhaps society in generally. Perhaps seeing the connection to the One/Source that we all have. With a number 2 reading here, it indicates that you have low energy, but nonetheless you are starting to take in more. The H3 in 4B is what indicates that you have to work more on your confidence/self-esteem levels. If you are just coming into understanding some of the higher teachings, you may feel overwhelmed with joy and Love at times, but then you may not know how to speak this knowledge in a way that others will understand. What is more important for you now is to remain in the experiential realm and continue to fill your bodies with Light energy. The words and the wisdom that you are sensing will start to emerge gradually and you will find that you are more centered about what you are saying. Besides others will not understand what you have to say yet, without seeing direct results in your life. The 5th chakras is where you need to focus some attention. With back to back chakras reading a closed type of energy, an R and an H, you are more susceptible to dis-comfort in this area. Congestion, sore throats, energy blocks, etc. The 5F reflects your ability to speak out for your inner truth. With an R4 reading there, the energy is coming out sharply or aggressively without a lot of deeper thought. With the H4 reading in 3F, you don’t have a full grasp on your personal power at this time, you are holding back thoughts and feelings that you might want to bring forth, but are unable to because there might be some inner agitation preventing you from speaking. As your energy balances out more, this will become less and less. It would be good to go to spiritual groups where everyone gets the opportunity to speak to get more comfortable with this. Try sharing deeper truths in this safer environment as it will help the energy flow. The 5B reading an H3 indicates that you are not really doing the work/career path that you would find the most joy in at this time or in the most alignment with your spiritual path. You are resisting doing what you truly would find happiness in because of the 3F/power and 4B/confidence readings, but this will come in time, so don’t push that too much. Moving to the top chakras, these indicate that you are taking in some spiritual guidance at this time and this is what is your current guiding light. 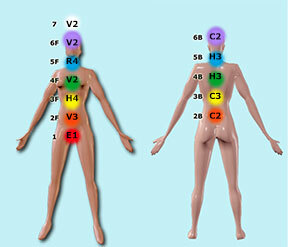 This is the V2 in both 6F and 7/crown, as well as the C2 in the 6B chakra. It would indicated that this is new energy as the readings are in the 2 range, so your guidance is really working to help you awaken. It is your confirmation that you are on the right path and that whatever you don’t fully understand right now is OK, because you have this as a very strong connection and it is developing. Your third eye is beginning to open and starting to receive more Light and you are beginning to act on some of this higher wisdom that you are receiving, so keep it up. The more you do, the quicker the rest of these chakras will follow suit.